After spending our morning in the outskirts of Ubud, we headed up towards Bali's north to Mount and Lake Batur. Since I heard about the Bali Aga tribe, living in their traditional ways on the shores of lake Batur, I have really wanted to go. I wasn't sure I was brave enough to get in a boat and visit the tribe that wraps and leaves their dead under a big fragrant -magical even- tree to decompose, but I was very excited at the idea that such a remote way of life can survive just across the busy and touristy shores. Entering Kintamani area, you have to pay a fee of roughly £10. The mountain is actually an active volcano and the lake is covering one side of it. Arriving at the south side of the lake, you are still quite high in altitude with amazing panoramic views, but you soon realise that this whole mountain-lake system is actually part of the older, much larger crater that you are about to drive down into! It's very difficult to draw your eyes away from the view, it feels like you have dived into a cart-postal that some adventurous, explorer friend has sent, from far far away. And yet, here you are! Our driver was a bit wary of the local vendors; he mentioned that they can be a bit aggressive with their selling techniques, hence he prompted us to be cautious, once he dropped us off at Kedisan's promenade. It is a small village right on the south edge of the lake, with a lot of the agricultural land backing into the waters, for irrigation. There isn't much infrastructure, just a floating restaurant and a few basic shops. The driver's cautionary words, the wilderness of the landscape and the idea of the ancient tribe closely, kind of scarred me a little bit, so we did not stay long. I wish I had shaken it all off and taken the time to explore the area more, hike up the volcano, visit the temples and the hot springs nearby... it's all part of the exploring process, I guess. We can always come back! 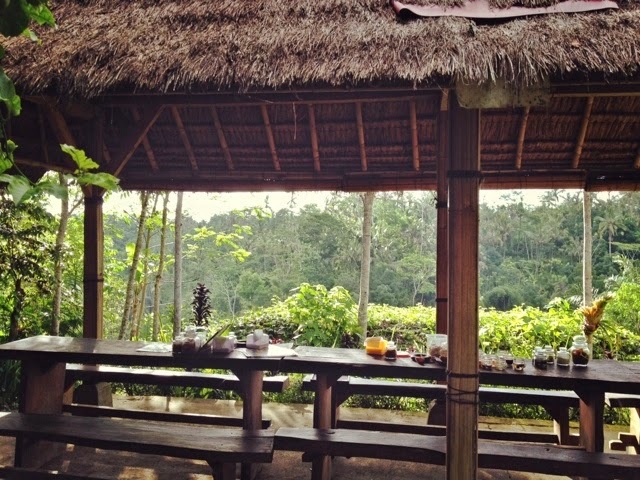 On the way back to Ubud our driver suggested we stop for Kopi Luwak, or Civet Coffee or simply cat poo coffee! The burning question... how did cat poo coffee taste? Well, it was very much like Greek or Turkish coffee; ground and boiled in water and then let to set at the bottom of the cup, strong flavoured but apparently not so high in caffeine content. It was a bit sharper though. And to be fair, these little creatures, are not cats, they are Asian Civets; a fox-like cute creature that only feeds on papaya and coffee beans. When we got there, there was nothing but lush vegetation, no signs, no buildings just a path amongst the trees, where we saw a couple of Asian civets in cages, munching away on their papaya... not sure it's the most natural setting for them but we certainly didn't witness the imprisonment conditions that we read about online, thereafter. Like any other farmed produce, it is important to find balance between profits and ethics. Midway through the path an old toothless Balinese lady was roasting coffee over an open wood fire and we got to see all of the stages that the beans go through until they are roasted and ground. Locals discovered this specially digested bean, when the workers in Dutch-owned plantations were not allowed to take beans home and realised that the little civet eats the beans and digests them whole, reducing the caffeine content in the process. 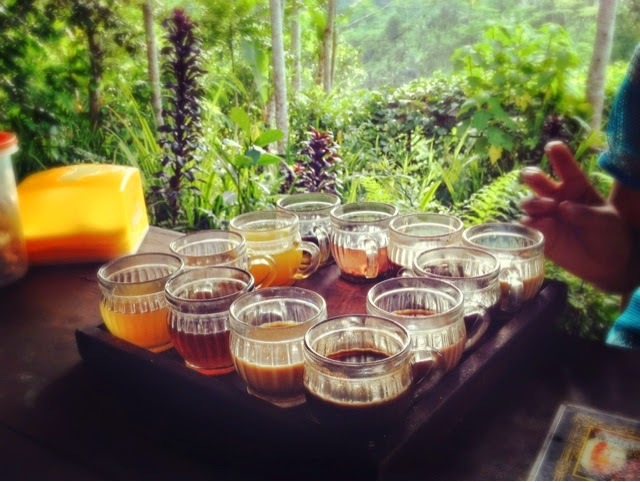 Off course the farm does not produce only Civet Coffee, they primarily produce normal coffee with a dozen infusions, palm sugar and other herb potions. Ginseng coffee was my favourite, Tamarind potion was interesting and we even got offered tobacco. The young girl who was showing us around kept calling it marijuana; we laughed straight away, knowing that was not the case, but the couple next to us were staring at her with the most petrified look! The more they stared, the more she said it! Clever little thing! 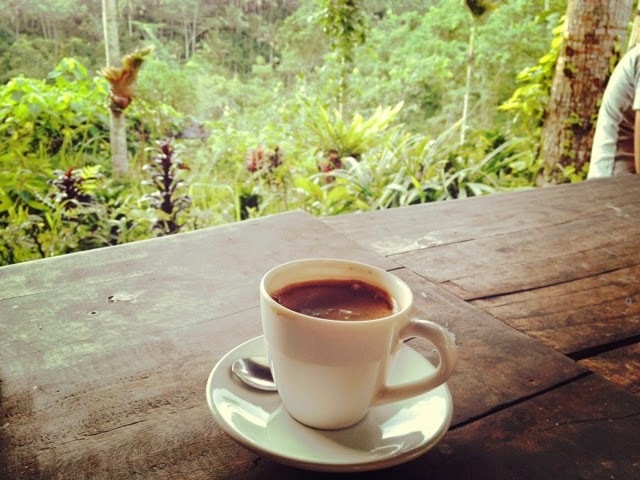 I'm not sure I would pay to have Civet Coffee outside of Bali; but sitting there peacefully under the little hut, after a whole day of driving around, completely engulfed by jungle and lush vegetation, sipping on sweet Ginseng Coffee, certainly makes the cut into my bucket list! Last stop on the way back to the Alila in Ubud was the Elephant Cave or Goa Gaja. How magical does that sound? I was prepared for a massive cave with elephants roaming around. Reality was a bit different but equally fascinating. This is a small sanctuary, built between two rivers, hence it unfolds around a pool of fresh water with an impressive carving on the rock face, above the cave opening. As the name suggests it is an elephant carving but I couldn't see it. 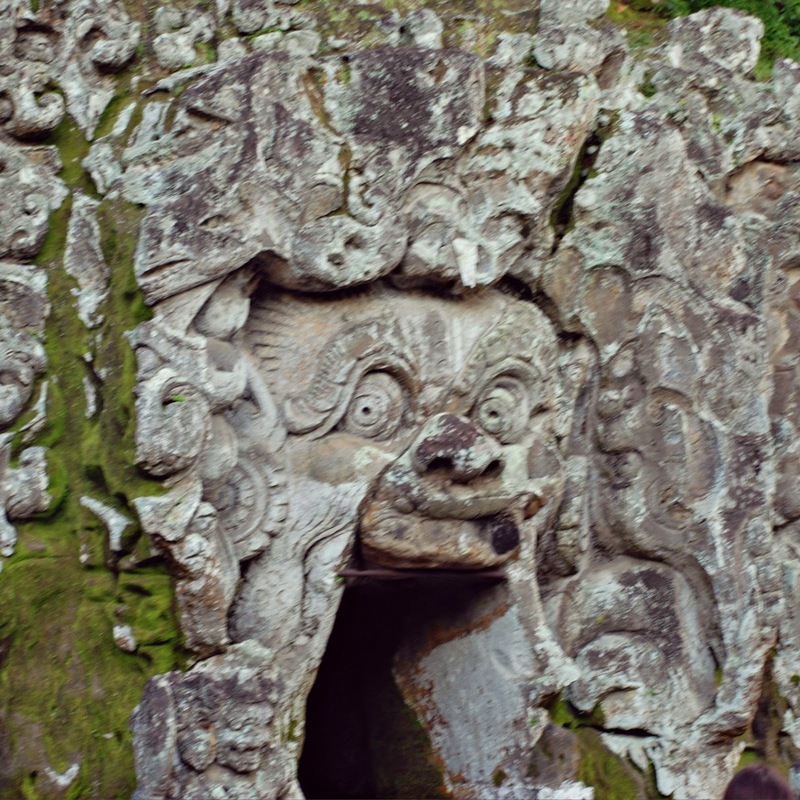 It reminded me more of the faces on the statues that guard Balinese houses and temples, to ward off evil spirits. Apparently, both Buddhist and Hindu symbols and statues have been found here that indicate the peaceful co-existence of the two religions. We got there late in the afternoon and we realised that this site remains open 24 hours a day! It's about 10 minutes east from Ubud centre, so visiting when the crowds are gone will leave you free to enjoy the site almost alone, like we did! Playing around the pool with elephants, walking around postcard perfect rice fields, joining the devotees at Tirta Empul Temple around the colourful water spring, standing on the edge of a volcano, relaxing amongst the tranquillity of Balinese countryside, tasting all things wonderful and weird and finally having the peaceful Elephant Cave site all to ourselves as the sun started going down! Thank you Bali for such an amazing day! This is an amazing post i have ever read! All the pictures are awesome. Civet is One of the best coffee in the world. Some farmers keep this coffee for months and even years just to decrease the acid and caffeine level. I just love to drink a cup of civet coffee.